At presentation, 60% to 80% of patients with acute ischemic stroke (AIS) have systolic blood pressures (SBP) over 140 mm Hg.1-3 Patients with preexisting hypertension may have SBP magnitudes higher.4,5 Commonly, this acute hypertensive response abates within 24 hours, returning to the patient’s previous baseline over several days.6 The return to baseline and rapid normalization of BP after arterial recanalization7,8 both underscore the physiologic role of the acute hypertensive response. 5. contextual advantages and disadvantages of available pharmacologic BP treatments. CPP = MABP − ICP. Reperfusion is a critical part of the standard of care for patients with AIS and the most direct approach to improve CBF, VO2, and DO2.35 Reperfusion is, however, only a milestone on a therapeutic continuum. Prevailing circumstances of each point on that continuum determine how BP is best managed. The brain of anyone with AIS can be thought of as 2 distinct compartments, each with different flow physiology, requirements, and attributes. The ischemic compartment, the primary therapeutic target, has no autoregulation, is pressure-dependent CBF, and has OEF at risk of being exhausted.36-38 The nonischemic compartment, unaffected brain tissue, has preserved autoregulation and pressure-independent flow. Throughout the therapeutic continuum, the simultaneous effects of managing BP on both compartments must be considered. The post-reperfusion interval is more complicated with less predictable and less uniform physiologic patterns, largely due to variability in timing and success of revascularization and its consequences on tissue integrity. Complete reperfusion (ie, Thrombolysis in Cerebral Infarction [TICI] score = 3) has different implications than partial reperfusion (ie, TICI = 1 or 2a), and both are influenced by timing of revascularization. In the postreperfusion interval, the priority shifts from improving collateral perfusion by elevating MABP to preventing further damage to the injured vascular bed from elevated SBP. Management strategies must be tailored to individual cerebrovascular scenarios and how these evolve over time. When reviewing the literature, these considerations must also be taken into account, because most studies do not clearly define what the prereperfusion and postreperfusion intervals were during protocol implementation, rendering conclusions somewhat artificial and impractical. A single optimal therapeutic target for BP is likely an oversimplication; this may explain negative clinical trial results for BP reduction in patients with AIS and the harmful effects of early administration of antihypertensive agents (Table). The 3 trials of BP reduction43-45 focused on safety and prevention of complications over effectiveness. The other 2 studies,46,47 focused on protecting the penumbra from intracellular calcium influx with an agent with powerful antihypertensive effects. In all 5 studies, therapeutic intervals varied considerably and were considered homogeneous for each study. BP levels that qualified patients for inclusion in the first 3 studies varied. In 2 studies patients with SBP of 140 mm Hg (who would not be treated in clinical practice) were included.43,44 In the 2 neuroprotective studies,46,47 the baseline BP reported would typically not result in active BP treatment, and effects of treatment on BP during the acute period were not reported. In summary, existing data regarding active treatment of elevated BP in patients with AIS are of poor quality and difficult to translate into practical bedside application. As noted, dehydration is present in 30% to 60% of patients with AIS and clearly associated with poorer outcomes.39-42 Dehydration is also relatively easy to treat, with potentially high payout, considering that administering IV isotonic crystalloid is safe and relatively easy for most patients. Intravascular volume restoration should be carried out independently of BP because the hypertensive response may partly result from dehydration.48,49 Before reperfusion, rehydration will benefit collateral circulatory support of the ischemic penumbra. After reperfusion, maintaining intravascular volume is likely necessary because other aspects of care (eg, osmotic diuresis caused by most contrast agents) reduce intravascular volume. Although aggressive BP reduction after AIS is generally not recommended, ignoring excessively high SBP is also counterproductive. The existing literature supports a U-shaped relationship between BP at admission and poor outcomes, including mortality.2,31,32,34,50 Because information about how BP evolved, was treated, or influenced treatment in these studies is not available, however, it remains unclear exactly what BP range is safe and effective. As discussed, CPP requirements vary and evolve, with modestly elevated systemic BP measurements being somewhat necessary during the prereperfusion interval,2,31,32,34,50,51 leading to popularization of the term permissive hypertension that is poorly defined and not well studied. Allowing BP in the optimal range defined earlier (MABP 100-140 mm Hg; SBP 150-200 mm Hg) for patients with AIS should provide the best chance for a good outcome. Once arterial recanalization and primary brain tissue reperfusion have started, the need for higher-than-normal BP dissipates, and excess is likely to increase increased capillary permeability and extravasation of fluid (ie, edema) and/or blood products (ie, hemorrhage). During the post-reperfusion interval, elevated SBP for 24 hours after IV thrombolysis is associated with poor outcome,52 particularly if there are symptomatic intracerebral hemorrhages.53 The reported optimal SBP in these studies approximates 140 mm Hg to 150 mm Hg, which is lower than specified by studies of BP at admission and supports the postulated benefit of BP decline after reperfusion. Although recommendations from experts62 and published guidelines63 provide little practical guidance for BP management in AIS, it is possible to construct a management protocol using the concepts discussed (Figure). Figure. A management protocol constructed from principles discussed, available evidence, and expert recommendations. Abbreviations: CPP, cerebral perfusion pressure; EVT, endovascular treatment; ICP, intracranial blood pressure; MABP, mean arterial blood pressure; SPB, systolic blood pressure. The most reasonable strategy for BP management, from the patient’s arrival through actual reperfusion, is akin to what has been termed permissive hypertension. 1. Assure euvolemia using isotonic crystalloids. 3. Assure that MABP remains higher than 100 mm Hg. These 3 steps maximize chances of maintaining CPP to protect the ischemic penumbra, while reducing the risk of unnecessarily elevated SBP that is clearly associated with worse outcomes.32,34 Although there may be a temptation to reduce SBP below 185 mm Hg in patients who will be treated endovascularly (without concurrent or pre-emptying IV thrombolysis), the existing literature does not support this.64 As a therapeutic threshold for SBP in those having endovascular procedures, 200 mm Hg may be more reasonable both because it makes MABP above 100 mm Hg (the desired lower threshold) more likely, and because BP will likely be reduced during the procedure by medications used for sedation. Additionally, once reperfusion is achieved, BP will be reduced spontaneously7,8 or can be carried out expeditiously with a wider safety margin. Near-obsessive attention to euvolemia must continue after reperfusion, perhaps even more so because patients are often affected by the osmotic diuretic effect of contrast agents used in diagnostic procedures. Although this range is wholly compatible with the current guidelines,35 in accordance with the understood limitations of this approach, close monitoring to determine if and when reperfusion is achieved should be an inherent component of any treatment protocol. This is a difficult and important task because once reperfusion is achieved the benefit of elevated SBP and MABP is greatly reduced, and therapeutic strategy should shift to prevention of fluid and blood product extravasion and management of any hemorrhage that occurs. Thus, optimal MABP is 85 mm Hg (70 + 15) for perfusion under specific conditions (70 mm Hg = mean minimal CPP when range = 60-80 mm Hg and 15 mm Hg = normal ICP upper limit [20 cm H2O = 15 mm Hg].20 This approach also makes it possible to recalculate patients’ needs under varying conditions. Needless to say, such calculations must be accompanied by careful consideration of whether or not reperfusion occurred and was complete and successful, as well as the safe and allowable levels of SBP described earlier. As part of the continuum of care, BP management eventually shifts from recovery after ischemia to prevention of secondary stroke with risk-factor modification. With few exceptions, after 48 hours of treatment, lowering systemic BP to the individual’s baseline level and gradual reducing it to normal improves long-term outcomes of mortality and overall cardiovascular health.43-45 An approach tailored to each clinical situation, with consideration of all of the variables discussed in this article, seems to represent the most reasonable path. Pseudohypertension. In patients with significant atherosclerosis, arterial wall rigidity—identifiable at the bedside—may cause falsely elevated BP measurements.72 Although earlier publications retrospectively estimated prevalence of pseudohypertension as 5% to 7% of adults over age 60,72,73 more recent reports suggest prevalence may be as high as 50%.74 Care must be exercised when measuring BP in patients with severe atherosclerosis because the values obtained may be falsely elevated, putting these patients at risk of overtreatment. 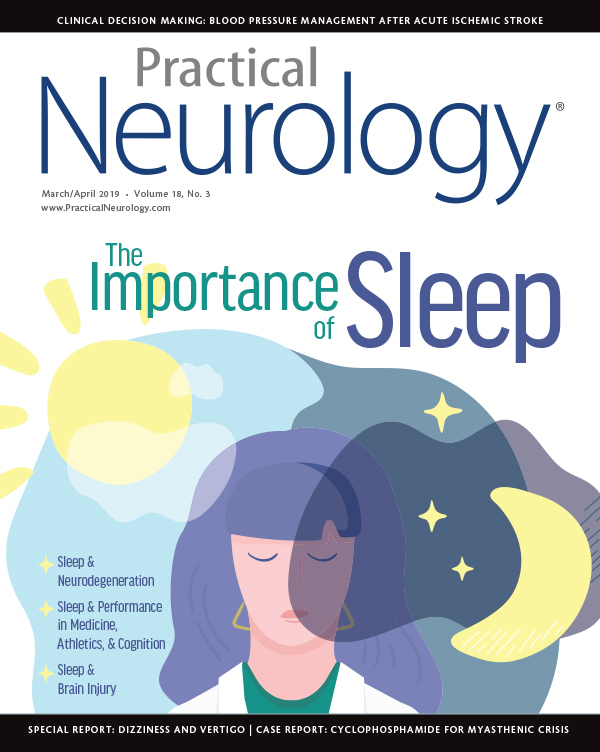 Management of systemic BP during AIS—a major neurologic emergency — represents an important, complex, and challenging aspect of care. A thorough understanding of cerebrovascular physiology and how it is impaired under conditions of ischemia is critical to the clinical decision-making process. Protecting and preserving penumbral tissue by optimizing collateral flow before therapeutic reperfusion requires sufficiently elevated MABP, achieved by tolerating higher than normal SBP. Along the therapeutic time continuum, after successful reperfusion, lowering SBP to a range associated with improved outcomes then becomes the primary management target. 1. Bangalore S, Schwamm L, Smith EE, et al. Blood pressure and in-hospital outcomes in patients presenting with ischaemic stroke. Eur Heart J. 2017;38(37):2827-2835. 2. Leonardi-Bee J, Bath PM, Phillips SJ, Sandercock PA, Group ISTC. Blood pressure and clinical outcomes in the International Stroke Trial. Stroke. 2002;33(5):1315-1320. 3. Qureshi AI, Ezzeddine MA, Nasar A, et al. Prevalence of elevated blood pressure in 563,704 adult patients with stroke presenting to the ED in the United States. Am J Emerg Med. 2007;25(1):32-38. 4. Jauch EC, Saver JL, Adams HP, Jr., et al. Guidelines for the early management of patients with acute ischemic stroke: a guideline for healthcare professionals from the American Heart Association/American Stroke Association. Stroke. 2013;44(3):870-947. 5. Rodriguez-Yanez M, Castellanos M, Blanco M, et al. New-onset hypertension and inflammatory response/poor outcome in acute ischemic stroke. Neurology. 2006;67(11):1973-1978. 6. Qureshi AI. Acute hypertensive response in patients with stroke: pathophysiology and management. Circulation. 2008;118(2):176-187. 7. John S, Hazaa W, Uchino K, Hussain MS. Timeline of blood pressure changes after intra-arterial therapy for acute ischemic stroke based on recanalization status. J Neurointerv Surg. 2017;9(5):455-458. 8. Mattle HP, Kappeler L, Arnold M, et al. Blood pressure and vessel recanalization in the first hours after ischemic stroke. Stroke. 2005;36(2):264-268. 9. Chamorro A, Amaro S, Vargas M, et al. Catecholamines, infection, and death in acute ischemic stroke. J Neurol Sci. 2007;252(1):29-35. 10. Soros P, Hachinski V. Cardiovascular and neurological causes of sudden death after ischaemic stroke. Lancet Neurol. 2012;11(2):179-188. 11. Gomez CR. Time Is Brain: The stroke theory of relativity. J Stroke Cerebrovasc Dis. 2018;27(8):2214-2227. 12. Astrup J, Siesjo BK, Symon L. Thresholds in cerebral ischemia - the ischemic penumbra. Stroke. 1981;12(6):723-725. 13. Heiss WD, Sobesky J, Hesselmann V. Identifying thresholds for penumbra and irreversible tissue damage. Stroke. 2004;35(11 Suppl 1):2671-2674. 14. Aaslid R, Lindegaard KF, Sorteberg W, Nornes H. Cerebral autoregulation dynamics in humans. Stroke. 1989;20(1):45-52. 15. Fantini S, Sassaroli A, Tgavalekos KT, Kornbluth J. Cerebral blood flow and autoregulation: current measurement techniques and prospects for noninvasive optical methods. Neurophotonics. 2016;3(3):031411. 16. Meng L, Gelb AW. Regulation of cerebral autoregulation by carbon dioxide. Anesthesiology. 2015;122(1):196-205. 17. Numan T, Bain AR, Hoiland RL, Smirl JD, Lewis NC, Ainslie PN. Static autoregulation in humans: a review and reanalysis. Med Eng Phys. 2014;36(11):1487-1495. 18. Tzeng YC, Ainslie PN. Blood pressure regulation IX: cerebral autoregulation under blood pressure challenges. Eur J Appl Physiol. 2014;114(3):545-559. 19. van Beek AH, Claassen JA, Rikkert MG, Jansen RW. Cerebral autoregulation: an overview of current concepts and methodology with special focus on the elderly. J Cereb Blood Flow Metab. 2008;28(6):1071-1085. 20. Madhok DY, Vitt JR, Nguyen AT. Overview of neurovascular physiology. Curr Neurol Neurosci Rep. 2018;18(12):99. 21. Lucas SJ, Tzeng YC, Galvin SD, Thomas KN, Ogoh S, Ainslie PN. Influence of changes in blood pressure on cerebral perfusion and oxygenation. Hypertension. 2010;55(3):698-705. 22. Tan CO. Defining the characteristic relationship between arterial pressure and cerebral flow. J Appl Physiol. 2012;113(8):1194-1200. 23. Pires PW, Dams Ramos CM, Matin N, Dorrance AM. The effects of hypertension on the cerebral circulation. Am J Physiol Heart Circ Physiol. 2013;304(12):H1598-1614. 24. Strandgaard S, Olesen J, Skinhoj E, Lassen NA. Autoregulation of brain circulation in severe arterial hypertension. Br Med J. 1973;1(5852):507-510. 25. Schmidt B, Klingelhofer J, Perkes I, Czosnyka M. Cerebral autoregulatory response depends on the direction of change in perfusion pressure. J Neurotrauma. 2009;26(5):651-656. 26. Xiong L, Liu X, Shang T, et al. Impaired cerebral autoregulation: measurement and application to stroke. J Neurol Neurosurg Psychiatry. 2017;88(6):520-531. 27. Markus HS. Cerebral perfusion and stroke. J Neurol Neurosurg Psychiatry. 2004;75(3):353-361. 28. Rosengarten B, Huwendiek O, Kaps M. Neurovascular coupling and cerebral autoregulation can be described in terms of a control system. Ultrasound Med Biol. 2001;27(2):189-193. 29. Hamel E. Perivascular nerves and the regulation of cerebrovascular tone. J Appl Physiol (1985). 2006;100(3):1059-1064. 30. Derdeyn CP, Videen TO, Yundt KD, et al. Variability of cerebral blood volume and oxygen extraction: stages of cerebral haemodynamic impairment revisited. Brain. 2002;125(Pt 3):595-607. 31. Castillo J, Leira R, Garcia MM, et al. Blood pressure decrease during the acute phase of ischemic stroke is associated with brain injury and poor stroke outcome. Stroke. 2004;35(2):520-526. 32. Okumura K, Ohya Y, Maehara A, et al. Effects of blood pressure levels on case fatality after acute stroke. J Hypertens. 2005;23(6):1217-1223. 33. Weiss A, Beloosesky Y, Kenett RS, Grossman E. Systolic blood pressure during acute stroke is associated with functional status and long-term mortality in the elderly. Stroke. 2013;44(9):2434-2440. 34. Stead LG, Gilmore RM, Decker WW, Weaver AL, Brown RD, Jr. Initial emergency department blood pressure as predictor of survival after acute ischemic stroke. Neurology. 2005;65(8):1179-1183. 35. Powers WJ, Rabinstein AA, Ackerson T, et al. 2018 Guidelines for the early management of patients with acute ischemic stroke: a guideline for healthcare professionals from the American Heart Association/American Stroke Association. Stroke. 2018;49(3):e46-e110. 36. Aries MJ, Elting JW, De Keyser J, Kremer BP, Vroomen PC. Cerebral autoregulation in stroke: a review of transcranial Doppler studies. Stroke. 2010;41(11):2697-2704. 37. Eames PJ, Blake MJ, Dawson SL, Panerai RB, Potter JF. Dynamic cerebral autoregulation and beat to beat blood pressure control are impaired in acute ischaemic stroke. J Neurol Neurosurg Psychiatry. 2002;72(4):467-472. 38. Olsen TS, Larsen B, Herning M, Skriver EB, Lassen NA. Blood flow and vascular reactivity in collaterally perfused brain tissue. Evidence of an ischemic penumbra in patients with acute stroke. Stroke. 1983;14(3):332-341. 39. Liu CH, Lin SC, Lin JR, et al. Dehydration is an independent predictor of discharge outcome and admission cost in acute ischaemic stroke. Eur J Neurol. 2014;21(9):1184-1191. 40. Rodriguez GJ, Cordina SM, Vazquez G, et al. The hydration influence on the risk of stroke (THIRST) study. Neurocrit Care. 2009;10(2):187-194. 41. Rowat A, Graham C, Dennis M. Dehydration in hospital-admitted stroke patients: detection, frequency, and association. Stroke. 2012;43(3):857-859. 42. Bahouth MN, Gaddis A, Hillis AE, Gottesman RF. Pilot study of volume contracted state and hospital outcome after stroke. Neurol Clin Pract. 2018;8(1):21-26. 43. Bath PM, Martin RH, Palesch Y, et al. Effect of telmisartan on functional outcome, recurrence, and blood pressure in patients with acute mild ischemic stroke: a PRoFESS subgroup analysis. Stroke. 2009;40(11):3541-3546. 44. He J, Zhang Y, Xu T, et al. Effects of immediate blood pressure reduction on death and major disability in patients with acute ischemic stroke: the CATIS randomized clinical trial. JAMA. 2014;311(5):479-489. 45. Schrader J, Luders S, Kulschewski A, et al. The ACCESS Study: evaluation of acute candesartan cilexetil therapy in stroke survivors. Stroke. 2003;34(7):1699-1703. 46. Kaste M, Fogelholm R, Erila T, et al. A randomized, double-blind, placebo-controlled trial of nimodipine in acute ischemic hemispheric stroke. Stroke. 1994;25(7):1348-1353. 47. Wahlgren NG, MacMahon DG, De Keyser J, Indredavik B, Ryman T. Intravenous nimodipine West European stroke trial (INWEST) of nimodipine in the treatment of acute ischemic stroke. Cerebrovasc Dis. 1994;4(3):204-210. 48. Holbein WW, Bardgett ME, Toney GM. Blood pressure is maintained during dehydration by hypothalamic paraventricular nucleus-driven tonic sympathetic nerve activity. J Physiol. 2014;592(17):3783-3799. 49. Thornton SN. Cold-induced dehydration decreases tissue perfusion and increases blood pressure. Arch Intern Med. 2009;169(12):1166-1167. 50. Vemmos KN, Tsivgoulis G, Spengos K, et al. U-shaped relationship between mortality and admission blood pressure in patients with acute stroke. J Intern Med. 2004;255(2):257-265. 51. Wohlfahrt P, Krajcoviechova A, Jozifova M, et al. Low blood pressure during the acute period of ischemic stroke is associated with decreased survival. J Hypertens. 2015;33(2):339-345. 52. Ahmed N, Wahlgren N, Brainin M, et al. Relationship of blood pressure, antihypertensive therapy, and outcome in ischemic stroke treated with intravenous thrombolysis: retrospective analysis from safe implementation of thrombolysis in stroke-international stroke thrombolysis register (SITS-ISTR). Stroke. 2009;40(7):2442-2449. 53. Waltimo T, Haapaniemi E, Surakka IL, et al. Post-thrombolytic blood pressure and symptomatic intracerebral hemorrhage. Eur J Neurol. 2016;23(12):1757-1762. 54. Huang Y, Sharma VK, Robinson T, et al. 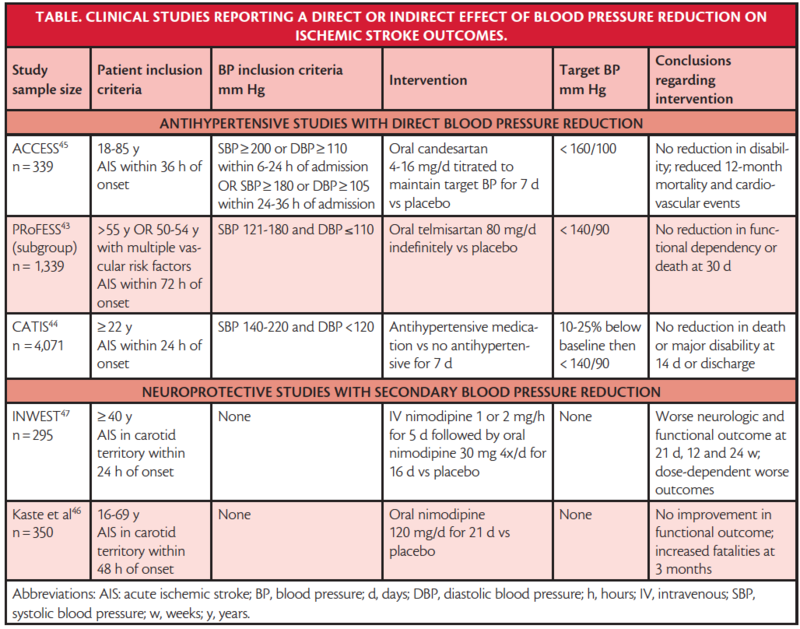 Rationale, design, and progress of the ehanced control of hypertension and thrombolysis stroke study (ENCHANTED) trial: an international multicenter 2 x 2 quasi-factorial randomized controlled trial of low- vs. standard-dose rt-PA and early intensive vs. guideline-recommended blood pressure lowering in patients with acute ischaemic stroke eligible for thrombolysis treatment. Int J Stroke. 2015;10(5):778-788. 55. Berkhemer OA, Fransen PS, Beumer D, et al. A randomized trial of intraarterial treatment for acute ischemic stroke. N Engl J Med. 2015;372(1):11-20. 56. Campbell BC, Mitchell PJ, Kleinig TJ, et al. Endovascular therapy for ischemic stroke with perfusion-imaging selection. N Engl J Med. 2015;372(11):1009-1018. 57. Goyal M, Demchuk AM, Menon BK, et al. Randomized assessment of rapid endovascular treatment of ischemic stroke. N Engl J Med. 2015;372(11):1019-1030. 58. Jovin TG, Chamorro A, Cobo E, et al. Thrombectomy within 8 hours after symptom onset in ischemic stroke. N Engl J Med. 2015;372(24):2296-2306. 59. Saver JL, Goyal M, Bonafe A, et al. Stent-retriever thrombectomy after intravenous t-PA vs. t-PA alone in stroke. N Engl J Med. 2015;372(24):2285-2295. 60. Nogueira RG, Jadhav AP, Haussen DC, et al. Thrombectomy 6 to 24 Hours after stroke with a mismatch between deficit and infarct. N Engl J Med. 2017;0(0):1-11. 61. Albers GW, Marks MP, Kemp S, et al. Thrombectomy for stroke at 6 to 16 hours with selection by perfusion imaging. N Engl J Med. 2018. 62. Jadhav AP, Molyneaux BJ, Hill MD, Jovin TG. Care of the post-thrombectomy patient. Stroke. 2018;49(11):2801-2807. 63. Leslie-Mazwi T, Chen M, Yi J, et al. Post-thrombectomy management of the ELVO patient: guidelines from the Society of NeuroInterventional Surgery. J Neurointerv Surg. 2017;9(12):1258-1266. 64. Mulder M, Ergezen S, Lingsma HF, et al. Baseline blood pressure effect on the benefit and safety of intra-arterial treatment in MR CLEAN (multicenter randomized clinical trial of endovascular treatment of acute ischemic stroke in the Netherlands). Stroke. 2017;48(7):1869-1876. 65. Manning LS, Rothwell PM, Potter JF, Robinson TG. Prognostic significance of short-term blood pressure variability in acute stroke: systematic review. Stroke. 2015;46(9):2482-2490. 66. Liu K, Yan S, Zhang S, Guo Y, Lou M. Systolic blood pressure variability is associated with severe hemorrhagic transformation in the early stage after thrombolysis. Transl Stroke Res. 2016;7(3):186-191. 67. Brott TG, Haley EC, Jr., Levy DE, et al. Urgent therapy for stroke. Part I. Pilot study of tissue plasminogen activator administered within 90 minutes. Stroke. 1992;23(5):632-640. 68. Hacke W, Kaste M, Bluhmki E, et al. Thrombolysis with alteplase 3 to 4.5 hours after acute ischemic stroke. N Engl J Med. 2008;359(13):1317-1329. 69. Mistry EA, Mistry AM, Nakawah MO, et al. Systolic blood pressure within 24 hours after thrombectomy for acute ischemic stroke correlates with outcome. J Am Heart Assoc. 2017;6(5). 70. Leng X, Lan L, Ip HL, et al. Translesional pressure gradient and leptomeningeal collateral status in symptomatic middle cerebral artery stenosis. Eur J Neurol. 2018;25(2):404-410. 71. Liu X, Zhang H, Ren L, et al. Functional assessment of the stenotic carotid artery by CFD-based pressure gradient evaluation. Am J Physiol Heart Circ Physiol. 2016;311(3):H645-653. 72. Messerli FH, Ventura HO, Amodeo C. Osler’s maneuver and pseudohypertension. N Engl J Med. 1985;312(24):1548-1551. 73. Anzal M, Palmer AJ, Starr J, Bulpitt CJ. The prevalence of pseudohypertension in the elderly. J Hum Hypertens. 1996;10(6):409-411. 74. Dai X, Wang H, Fang N. Prevalence and clinical characteristics of pseudohypertension in elderly patients prepared for coronary artery angiography. Medicine (Baltimore). 2017;96(48):e8386.